From the Department of Neurology (N.I.M.-C., M.C., C.V., M.A.S. ), University of Miami Miller School of Medicine FL; Department of Biology (Z.G., J.T.L.) and Department of Brain and Cognitive Sciences (Z.G., J.T.L. ), The Picower Institute for Learning & Memory, Massachusetts Institute of Technology, Cambridge; and Department of Human Genetics (S.C., A.P.R., L.A., S.Z., M.A.S. ), Hussman Institute for Human Genomics, University of Miami Miller School of Medicine, Miami, FL. (A) Family pedigree reveals multiple affected family members supporting autosomal dominant inheritance. Filled symbols are clinically affected individuals, arrow denotes the proband. (B) Both the proband and her mother presented long-standing pes cavus and hammer toes. (C) Table summarizing electrophysiologic findings for the proband and her mother. Main findings were significant postexercise facilitation in compound muscle action potential amplitudes, significant decremental response to 3 Hz repetitive stimulation, and normal sural sensory responses. (D) Graph summary of the proband's repetitive stimulation study demonstrating both decremental response to 3 Hz repetitive stimulation and significant postexercise increment. (E) Sanger sequencing revealed a 1112T>A substitution in both the proband and her mother, resulting in an isoleucine (I) to lysine (K) change at residue 371. (F) This residue is highly conserved across species. ADM = abductor digiti minimi; amp = Amplitude; dCMAP = distal compound muscle action potential; N/A = not applicable; Rep. stim. = repetitive nerve stimulation; SNAP = sensory nerve action potential. (A) Stereoview of residues found to be mutated in human synaptotagmin 2 patients (Asp307 [orange], Pro308 [yellow], and Ile371 [red]) modeled on the rodent synaptotagmin 1 C2B crystal structure. The 5 essential calcium binding residues are highlighted in green and calcium ions in red. (B) The ability of transgenes to rescue the lethality of Syt1 null mutants are shown. Larvae were collected at the 1st instar larval stage and placed into food vials. The number of animals surviving to the 3rd instar wandering larval stage was quantified. Quantification of average rescue ratio (%) for the indicated genotypes (Syt1−/− null, 50.5 ± 6.9, n = 3; elavC155-GAL4; Syt1−/−; UAS-SYT1, 100 ± 0, n = 3; elavC155-GAL4; Syt1−/−; UAS-SYT1 I426K, 2.9 ± 2.9, n = 3). (C) Western blot with anti-MYC (top panel) or anti-syntaxin (SYX–control) antisera from head extracts of control or transgenic Drosophila: WT (control), WT DSYT or I426K DSYT induction by elavC155-GAL4. (D) Representative larval NMJs stained with anti-MYC antisera (green) for animals with MYC-tagged WT or I426K SYT1. The axon is stained with the neuronal marker anti-HRP (blue). The boxed area is magnified in the bottom panel. 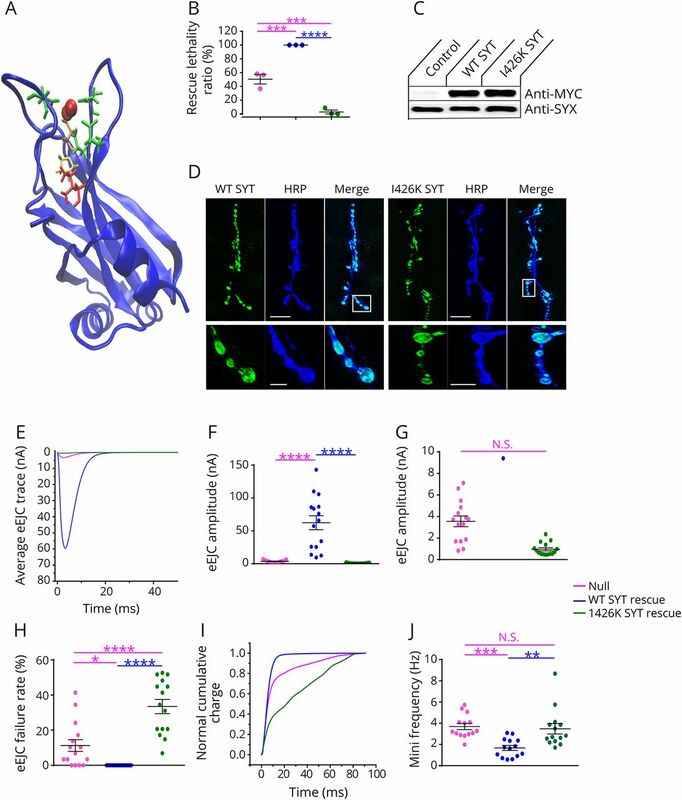 Mutant SYT1 targets normally to presynaptic terminals. Scale bar—20 μM—top panels; 5 μM—bottom panels. (E) Representative eEJCs recorded in 2 mM external calcium in Syt1−/− null larvae (red) and null mutants rescued with WT DSYT1 (blue) or I426K DSYT1 (green). (F) Quantification of mean eEJC amplitudes in the indicated genotypes: Syt1−/− null, 3.6 ± 0.5 nA, n = 15; elavC155-GAL4; Syt1−/−; UAS-SYT1, 62.3 ± 10.6 nA, n = 15; elavC155-GAL4; Syt1−/−; UAS-SYT1 I426K, 1.0 ± 0.2 nA, n = 15. (G) Expanded vertical axis scale of the data shown in (F). (H) Failure rates (%) as calculated by counting trials with no detectable eEJCs within 10 ms during 30 consecutive stimuli given at 0.5 Hz for the indicated genotypes: Syt1−/− null, 11.3 ± 3.4, n = 15; elavC155-GAL4; Syt1−/−; UAS-SYT1, 0 ± 0, n = 15; elavC155-GAL4; Syt1−/−; UAS-SYT1 I426K, 33.5 ± 4.0, n = 15. (I) Cumulative vesicle release defined by charge transfer normalized for the maximum in 2.0 mM calcium for each genotype (same color code as in E). Each trace was adjusted to a double exponential fit. Both the null and I426K rescued animals display a prominent increase in the slow asynchronous phase of release. 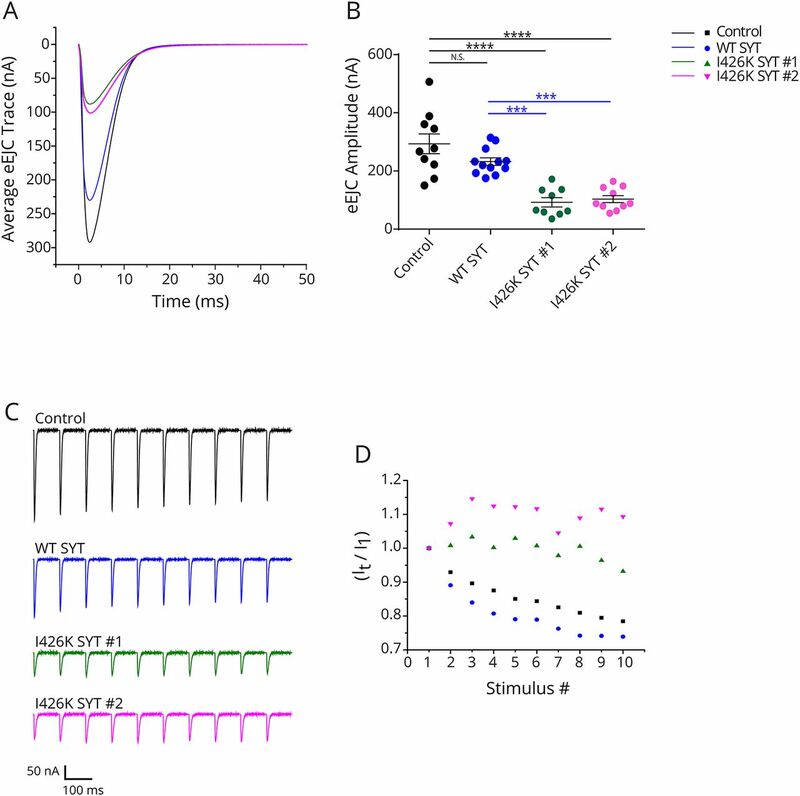 (J) Quantification of mini frequency in the indicated genotypes: Syt1−/− null, 3.7 ± 0.3 Hz, n = 14; elavC155-GAL4; Syt1−/−; UAS-SYT1, 1.7 ± 0.2 Hz, n = 14; elavC155-GAL4; Syt1−/−; UAS-SYT1 I426K, 3.5 ± 0.5 Hz, n = 14. Statistical significance was determined using 1-way analysis of variance (nonparametric) with post hoc Sidak multiple comparisons test. N.S. = no significant change (p > 0.05), *p < 0.05, **p < 0.005, ***p < 0.001, and ****p < 0.0001. All error bars are SEM. eEJC = excitatory junctional current; HRP = horseradish peroxidase; NMJ = neuromuscular junction; WT = wildtype. (A) Representative eEJCs recorded in 2 mM extracellular calcium at 3rd instar larval muscle 6 NMJs for the indicated genotypes (control, overexpression of WT or I426K DSYT1 with elavC155-GAL4). 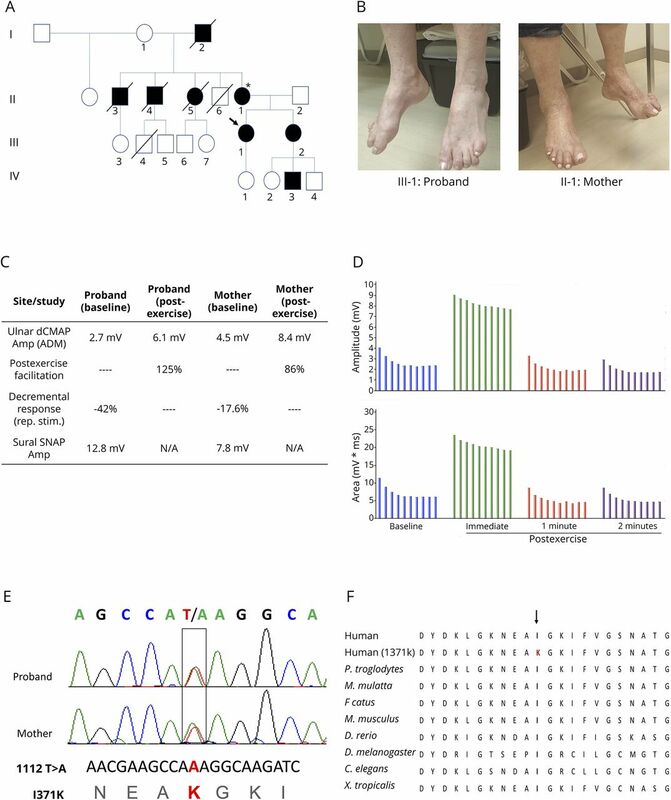 (B) Quantification of mean eEJC amplitude in the indicated genotypes: control elavC155-GAL4, 293.3 ± 34.2 nA, n = 10; elavC155-GAL4; UAS-SYT1, 223.9 ± 11.7 nA, n = 12; elavC155-GAL4; UAS-SYT1 I426K#1, 92.4 ± 15.9 nA, n = 9; elavC155-GAL4; UAS-SYT1 I426K#2, 103.2 ± 12.2 nA, n = 10). (C) Representative eEJCs during a 10 Hz tetanic nerve stimulation in 2 mM external calcium for the indicated genotypes. (D) The average eEJC for the first 10 responses normalized to the amplitude of the first response during a 10-Hz tetanus is shown for control (black), elavC155-GAL4; UAS-WT DSYT 1 (blue), elavC155-GAL4; UAS-DSYT1 I426K #1 (green) and elavC155-GAL4; and UAS-DSYT1 I426K #2 (magenta). Statistical significance was determined using 1-way analysis of variance (nonparametric) with post hoc Sidak multiple comparisons test. N.S. = no significant change (p > 0.05), ***p < 0.001, ****p < 0.0001. All error bars are SEM. eEJC = excitatory junctional current; NMJ = neuromuscular junction.